Having a complete understanding of the properties and behaviours of rock is essential when undertaking any engineering involving them. 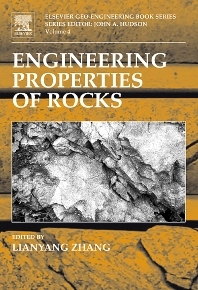 By drawing on the author’s years of experience in the field, Engineering Properties of Rocks covers the properties of a number of rocks, and explores discontinuities, strength, deformability and permeability of rock masses and calculations of stress. Practising civil engineers working in rock, whether undertaking site investigations or for design, excavation, etc; Researchers and post-graduate students wanting to gain practical knowledge in the field of rock mechanics. In 2014 Professor Zhang was Co-Chair of GeoShanghai International Conference.